Last year, around this time, I was telling you all to head on down to DUCTAC (Mall of Emirates) to watch "Short and Sweet" a competitive festival of ten minute plays. This year I am a hollering at you to get down to the Theatre. This, the second year of what was a highly successful few weeks of fun filled theatre last year, will absolutely be, even better. Practise make perfect after all. Just being in the Kilachand Studio Theatre before the lights went down was a delight. The auditorium was filled with participating theatre peeps, their families, friends and general theatre lovers. I listened in on conversations where actors and producers were networking away. Delighted "Hello! I have not seen you in forever Darlings!" littered the auditorium. "What are you doing?" was being asked by everyone. Hearing something along the lines of "I am performing in Short and Sweet" and of course the rejoinders, "Oh wonderful! We're coming. We will see yours next week!" There was more than one "Have you met so and so? You haven't? You must! You would be perfect for a role they need filling next month." Lots of warmth and a general buzz in the air of excitement and fun. 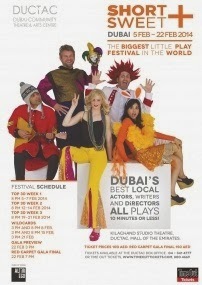 A delightful sprinkling of all the Who's Who in the Drama Zoo of Dubai. All this banter and conviviality was against a background of great background walk in music. Thanks for that Alex and the team. The right walk in music really set the tone for an evening at the theatre and you guys got it spot on. Last week showcased twenty one short plays varying in subject matter and genres. We were treated to such offerings as the delightfully absurd "Spider men" where for ten minutes we are flies on the wall (fall about the place laughing) observing a conversation between two male spiders living in a world were even a romantic interlude with their spouse could end up with the down trodden husbands being the dinner of their (clearly not so loving) wives. An ironic twist on who wears the pants in a home. Our hearts were warmed by the unfolding of the funny, sad story of the changing relationship between an older and younger sibling in pre-1947 India as they dealt with success, failure and family responsibility. It is always special when locally written plays get showcased and Sweet and Short give ample opportunity for local playwrites to show off their talents. These stand alongside the "imported" plays as equals in scope of subject and quality of the writing. See whats on at the Short + Sweet link here and book your tickets now. I know from experience ( see here) that if you don't book for the gala performances you may very well land up going home having missed out on the show as the tickets sell out fast. Below are my posts from last year. Don't miss out this year. If what I have seen so far is anyting to go by this year will be even better than last year and last year was great. the lat last word on Short and Sweet 2013.